General Motors continues development of its fifth-generation small-block V-8 engine due out soon and expects a sixth iteration farther down the road, despite coming strict new U.S. fuel-economy rules. GM, for example, recently launched the Buick Regal GS, a high-performance sports sedan using a 2.0L turbocharged 4-cyl. engine with gasoline direct-injection technology. At 270 hp, the mill represents the highest specific-output engine ever to come out of GM Powertrain and takes on competitors using bigger, naturally aspirated and sometimes boosted V-6 powerplants. GM also hinted at the future of its powertrains by showing the Cadillac Ciel concept car earlier this year powered by a version of the auto maker’s 3.6L V-6 engine with GDI and twin turbos. It was linked to a hybrid transmission. But the small-block V-8, a mainstay among GM trucks and performance cars for nearly 60 years, will continue to play a role in the auto maker’s future, Guard says. “We keep working on the refinement of it. “The company keeps making a commitment to the V-8,” he tells WardsAuto on the sidelines of an event here celebrating production of GM’s 100 millionth small-block engine. The auto maker will invest close to $1 billion in the fifth-generation small-block V-8, likely due within the next 18 months given major redesigns expected for GM trucks and the Chevrolet Corvette in that timeframe. The small-block V-8 has been part and parcel of those vehicles for years. Guard offers cylinder-deactivation technology as one solution the auto maker has been providing and refining since the fourth-generation small-block V-8 launched in 2007 in small volumes on the GMC Envoy SUV. The feature can increase truck fuel economy up to 8%. A Chevy Tahoe fullsize SUV equipped with a 320-hp 5.3L small-block V-8 achieves up to 21 mpg (11.2 L/100 km) on the highway. GM also has been selling trucks with a small-block 6.0L V-8 linked to a hybrid transmission, delivering a 40% improvement in fuel economy. A Corvette with a 436-hp 6.2L small-block V-8 gets 26 mpg (9.0 L/100 km) on the highway. But with the latest future corporate average fuel economy standard to come out in September pegged at 54.5 mpg (4.3 L/100 km) by 2025, Guard says lightweight materials will play an increasingly important role. Look for the next-generation small-block V-8 to include fuel-saving DIG technology, as WardsAuto first reported in August, he says. Guard declines to say whether stop/start technology might be added. Nor does he offer insight on whether GM finally might move away from the overhead-valve setup to an overhead cam, although the former has been shown to more easily enable the cylinder deactivation the auto maker likes. V-8 engine installations on domestic vehicles in the U.S. for the ’11 model year ran at a clip of 22.5% vs. 26.5% for ’01, according to WardsAuto data. GM currently sells more vehicles with 4-cyl. engines than those with V-8s. Stephens balks at the idea of trading the small-block V-8 for a truck and performance engine more closely resembling Ford’s popular 3.5 DOHC V-6 with EcoBoost technology, which uses turbocharging to provide V-8 performance. Take rates for the more-expensive EcoBoost engine on retail sales of the F-150 pickup were just over 40% over the last five to six months, according to Ford. 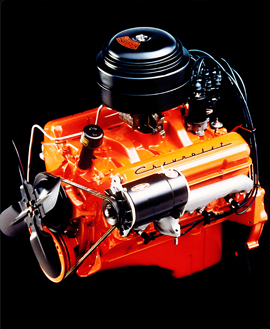 There’s no question the small-block V-8 has given GM a competitive advantage over the years, given its compact dimensions, light weight, serviceability and relatively high efficiency and output. The engine has been continuously improved, but in its 56 years has retained a 90-degree orientation, overhead valves, pushrod valvetrain and 4.4-in. (11.2-cm) on-center bore spacing. GM has sold enough of the engines to wrap the Earth at the equator twice, placed end to end. And “small-block V-8” arguably has become one of the most recognizable phrases in automotive circles. “It’s really become part of the American culture,” says Sam Winegarden, executive director-global engine engineering at GM.